The owner of this popular hotel and spa for pets was looking to give her busy website an updated responsive web design. We were able to furnish her with a full-screen site that has cross-browser compatibility and looks great on most mobile devices no matter how small the smartphone. 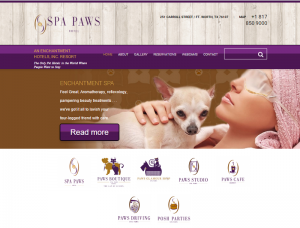 The new Spa Paws website now has a content management system that makes it much easier for them to keep their website current and well marketed with a blog and social network share icons. A promo slider highlights news on special posts and pages with full-width, colorful pictures. We also installed a photo gallery that is neat and easy to insert new pictures into! A first-class website to go with a first-class resort for animals.